If you want to bleed several radiators, start on the lowest floor and work upwards. 1. Turn on the CH system for at least 10 minutes and make sure all radiator valves / thermostatic heads are fully opened. Now the air will be collected at the air vents. 2. Set the central thermostat as low as possible so that the CH system is switched off. 3. Wait for about 10 minutes until the radiators have cooled. • Keep an air vent key, a moisture absorbing cloth and a collection container close to hand. Water in the CH system can be dark brown to black and may stain. • Look for the air vent. This is always at the top of the radiator, on the opposite side to the thermostatic head. 5. Open the air vent gently until you hear a whistling sound. After a short time water will also come out. Close the air vent when the water jet is regular. If the water continues to drip afterwards, it is best to replace the air vent. 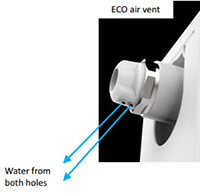 CAUTION: In the case of ECO air vent with 2 holes, the radiator is only bled when water comes out of both holes. 6. Switch the central heating back on. After bleeding radiators, the pressure in the circuit may be too low. You can bring the pressure back up to the correct level by topping up the system to an operating pressure between 1.5 and 2 bar (see the instructions for your boiler). This valve is usually close to the heating boiler. Open the valve and keep an eye on the manometer (pressure gauge) on the boiler dashboard. Close the valve as soon as the CH boiler indicates the recommended pressure. What is an ECO radiator? The ECO radiator is characterised by a unique and patented concept that guides water through our radiators in a particular way. 100% of the hot water flows first into the front panel (= direct inflow in front panel) providing multiple benefits for the end user. The temperature in the front will be higher, leading to more radiation heat which significantly increases your feeling of comfort. Due to the increased radiation at the front, less radiation heat is available at the back of the radiator by which the losses of heat through the wall will be reduced. In short with the ECO radiator you enjoy a better feeling of comfort, increased efficiency of your CH system and a reduction in your energy bill and CO2 emission. How do you identify an ECO radiator? An ECO radiator can be identified by the type of air vent and its marking on the side panel. If you are not entirely sure about this, contact your installer.